The year 1968 was a notable one for its political turmoil and rapidly changing social scene. It was the year Frank Sinatra first recorded his classic “My Way,” while movie-goers flocked to films like “Planet of the Apes” and “The Odd Couple.” It is the subject of a four-part series running on CNN. 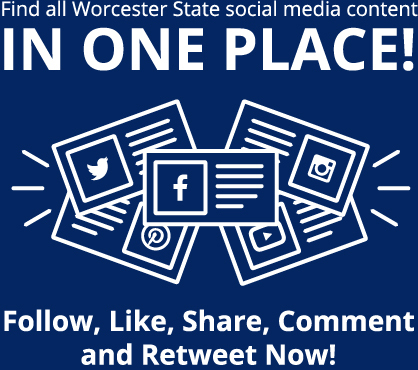 It also was the year Robert K. Sahagian, Ph.D. (Visual and Performing Arts), began his career at Worcester State. “That’s amazing. Fifty years of service, started in 1968,” Assistant Vice President for Human Resources, Payroll, Diversity, Inclusion, and Affirmative Action Stacey Luster said as master of ceremonies at the annual Employee Service Recognition and Retirement Celebration May 9. The event brought faculty and staff together to celebrate each other’s accomplishments and dedication to Worcester State University. In addition to the traditional employee service and retiree recognitions, the ceremony honored faculty members who recently attained tenure and the recipients of the Extraordinary Dedication, Campus Collaboration, and Diversity and Inclusion Awards. A new tradition also was begun this year—the presentation of Adjunct Faculty Awards. Technology Services) with 40 years, employees who had served 35, 25, 20, 15, 10 and five years were recognized as they posed for group photos with President Maloney. Retirees also were honored. This year’s group is Karen Brammer (Graduate and Continuing Education), Cynthia Donahue (History and Political Science), Carol A. Faron (Human Resources), Debra Fields Quinn (Enrollment Management), Nancy Lapriore (Alumni Affairs), Renee Metterville (Payroll), Rosemary Naughton (Student Affairs), Lynn B. Ryan (Payroll), Susan Seibel (Intensive English Language Institute), Lynda Shusta (Conference and Events Services), Gerald E. Sorge Jr. (Academic Affairs), Timothy Sullivan (Student Affairs), Judith Tuori (Nursing), and Thomas R. White (Information Technology Services). Alex Briesacher, Ph.D., (Sociology) received the 2018 Campus Collaboration Award, while the Diversity and Inclusion Award was presented to Timothy Murphy, Ph.D. (Urban Studies). New this year were the Adjunct Faculty Awards. The recipients were Daniel Vellone (Earth, Environment, and Physics) and Lisa Kramer (Visual and Performing Arts). This year’s Extraordinary Dedication Award recipients were Joan Safford (Registrar’s Office), Brenda Campbell (Procurement and Accounts Payable), Kenny Smith (Institutional Research), Julie Chaffee (Registrar’s Office), Syamak Moattari , DrPH (Health Sciences), and Martin Fromm, Ph.D. (History and Political Science). The Human Resources Department organized the event. 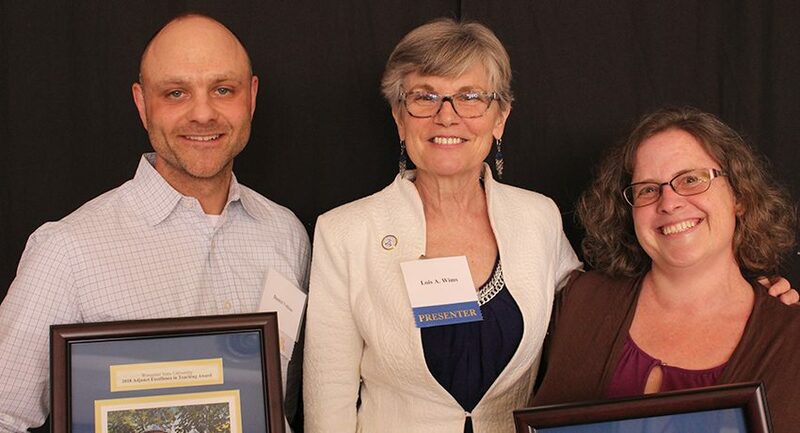 About the Photo: Provost Lois Wims, center, presented the inaugural Adjunct Faculty Awards, which were given to Daniel Vellone (Earth, Environment, and Physics) and Lisa Kramer (Visual and Performing Arts). 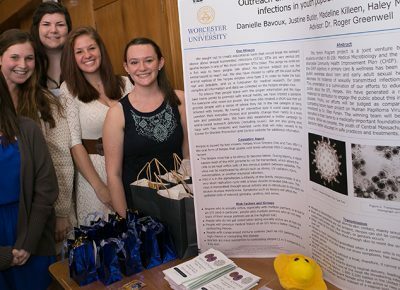 Danielle Bavoux (Nursing) has completed a three-year project on venereal disease, awareness, and prevention. Part of it was done for the Community Health Improvement Plan. She began working on this with Roger Greenwell (Biology) and Ellen Fynan (Biology) during her first year. As part of the Medical Microbiology course, she completed an "adopt a microbe" project for which she investigated a . . .